In some parts of the country, school starts in less than a month (in my neck of the woods, some kids go back next week!). School supplies are already dwindling in the bins, and the dollar aisle at Target is hot with deals. Many cities have "Stuff the Bus" campaigns where you have the opportunity to donate school supplies that will go to needy students in high-need schools. For the most part, I think this is a great idea. However, taxpayer dollars do pay for many of the supplies that public school children use. 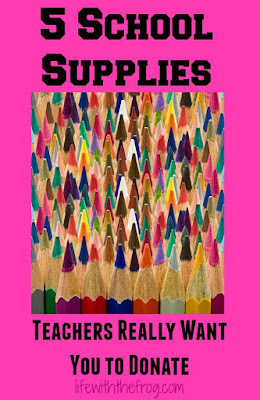 Regardless, there are always supplies that teachers end up buying out of their own pockets. With the average teacher salary in America at just a little over $55,000, that's a lot of one's own money to spend on consumable supplies. However, teachers do it because they want the best for their students. They want to make their classrooms exciting and colorful, and they want to give their students hands-on learning experiences that they will hopefully never forget. *Get creative: I found blank books in the dollar aisle at Target. How fun would it be for budding artists and illustrators to use those for book making? 2. Cleaning and personal care supplies. 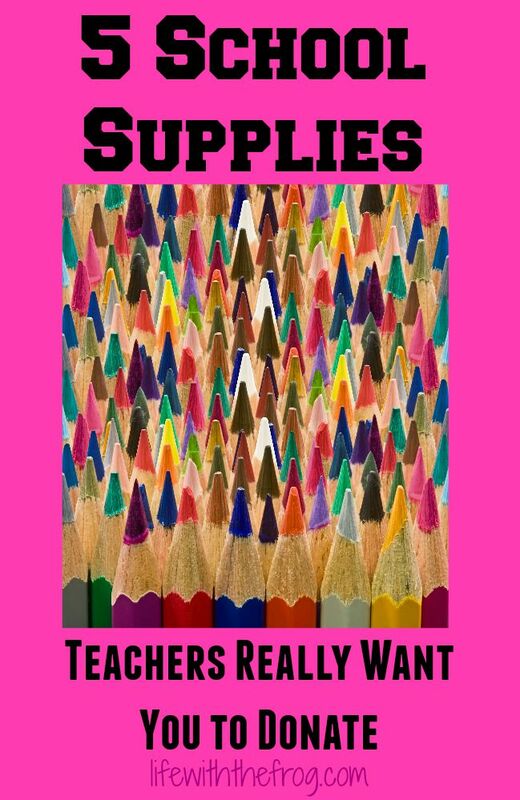 An overwhelming number of teachers cited the need for such staples as Kleenex, antibacterial wipes, and hand sanitizer. Many school districts do not provide these. In a public school, you can't really ask parents to provide anything. Many do send their child with a box of tissues, but the few I used to get ran out quickly. *Tip: Check out big box stores like Costco and Sam's Club for great deals. *Check out Pinterest, WeAreTeachers, and other websites to get an idea of the supplies STEAM classes might use. Or ask the school! 4. Time and Talent. Look, we all want our children to have hands-on learning experiences; but in order for that to happen, many times simply more hands are needed. Sometimes just having an extra body in the classroom is a god-send. If you have a specialized skill, such as computer programming or coding, offer to teach a few lessons. Some schools have had to cut music and art classes. Perhaps you could volunteer to teach an after school program for interested students. *Words of advice: You'll never know if you don't ask. 5. Basic necessities. In some of the poorest schools and school districts, children come to school improperly dressed for the weather. They go home to no food on the shelves. Some children have accidents at school, and have no clothes to change into. *Call your local school district to find out what needs they have OR Google "food and clothing donations to schools." Google gave me lists of cities like Portland, Atlanta, and others in Minnesota that have drives set up specifically to donate food and clothing for at-risk students. Ask your local school district or your child's classroom teacher what they need. It may be something as easy to find as stickers. Or it may be a greater need that you can help to fill. I get frustrated every year at the long supply lists our boys' private school posts every year. At the end of the year, they bring home many unopened and unused supplies. Save these to either use again or donate the next year. Or cut the list in half, and get half at semester break to help defray the cost. When I was a teacher, I spent a lot of my own money in order to make my classroom a colorful, exciting, and fascinating learning environment. I could do that because I was single. Now with a family to support, I don't know if I would be willing to spend my hard-earned money and not get reimbursed. But you know what? I'm sure I probably would, as do many thousands of other teachers because they love their jobs and they love the children they teach. Your children. Why not take some of the tips and suggestions I've given you above and help make a classroom more exciting and stimulating for this year's crop of learners? Teachers, what did I leave off this list? What's on your wish list?